« Fields and Fields of Canola—But is the Oil Healthy? ©Bert Gildart: From the west side loop in Glacier National Park the trail to Grinnell Overlook is straight up. First you climb four miles to Granite Park Chalet, and then you hike about a mile to the spur trail that takes off from the Highline Trail. At the spur trail you climb about 500 more vertical feet—and then you’re there. The view from the overlook is stunning. From the notch you peer down onto what used to be Grinnell Glacier, but because of global warming, the glacier has receded to the point where it is almost non-existent. 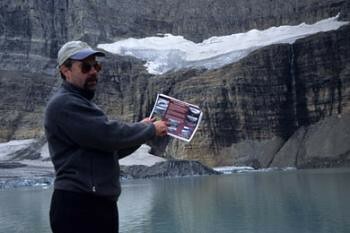 Where the glacier once existed, it has been replaced in the last 10 years by Upper Grinnell Lake. Where once the glacier flowed down the valley toward Many Glacier, there is only rock, all of which unfolds from the notch and that you can clearly see about 1,000 feet below you. Meaning, of course, that the obvious retreat might convince him that global warming should be taken seriously. Truly, this is a place where science and beauty overwhelm. In addition to the staggering beauty of glacier cirques, there is also the abundance of various life forms in and around the Overlook. One of the first wild creatures to greet us was the not-so-wild hoary marmot, and one of them posed about five feet from my camera, enabling me to use a wide-angle lens to include Heaven’s Peak in the background. Years ago I climbed the peak, reminding me that I have great hopes of attempting another climb in about three weeks just south of Seattle. But back to the here and now. Matt, who is fascinated by all forms of science (as am I), could not help but notice the abundance of huge chunks of rocks nearby with ripple marks. The rocks tell us that, once, they were laid down by vast inland seas, and that these particular chunks with their extensive ripple marks formed the shores of that sea. Then, about 40 million years ago, forces beneath the earth began to thrust upward, lifting that sea shore to where Matt and I stood this past Sunday—about 7,000 feet above sea level. As we sat there, listening to marmots whistle and eating lunch, we watched as what appeared to be a small bee landed on our hands. The bee, however, was not a bee rather it was a fly, something I learned years ago in an entomology class. Over the years (I once worked in Glacier as a ranger), I have been documenting the recession of Grinnell, and several years ago, as the glacier receded, I discovered that the rock exposed beneath the glacier was also exposing ancient stromatolites. 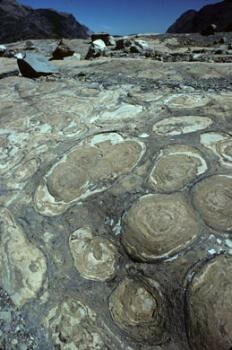 Stromatolites also existed in a marine environment, and that is the only place you’ll find similar creatures today. In fact they are an ancient form of algae, and several years ago I photographed them at the edge of what is now Upper Grinnell Lake. They too existed millions of years ago, but now, here they are, perhaps 6,000 feet above sea level. Though I tend to confine myself these days to travel writing and photography I am fascinated by this phenomena of global warming, something that is difficult for me not to accept. All scientific journals publish stories on the subject and all are peer reviewed. None of the scientists dispute the evidence, only the popular media questions it, but they are obligated to do so for the sake of balance. And that I believe undermines the urgency of the problem. It’s real, and any who question whether or not it is occurring only need to visit Glacier National Park and hike to the Grinnell Glacier Overlook. And when you do, invite George Bush to accompany you. This entry was posted on Tuesday, July 17th, 2007 at 12:33 pm and is filed under Glacier National Park, Natural History/Conservation. You can follow any responses to this entry through the RSS 2.0 feed. You can leave a response, or trackback from your own site. Whether the earth is warming or not is not under dispute. It obviously is. What is disputed is the degree to which human activities are contributing to this warming trend. As a person interested in geology, you know that the earth is always either in a warming or cooling cycle. It has been much colder than it is now and it has been much warmer than it is now even just a brief while ago (when the Vikings were grazing sheep and building villages in Greenland). 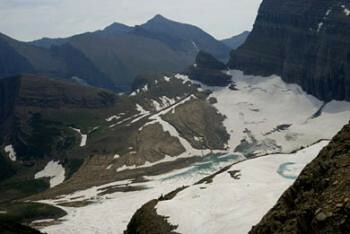 And if the glaciers all disappear in Glacier National Park this will not be the first time. This fact (that the earth warms and cools over time naturally) is the one never reported in the media and never mentioned by global warming activists. One might wonder whether, if the earth were currently in a cooling cycle, the same evidence (man-made pollution) would be suggested by the same groups as the cause for such cooling. In fact, it is conceivable that the earth would actually be warming at a faster pace were it NOT for man-made pollution. As a person interested in science, surely you would not suggest that taking a poll of scientists on this issue is a valid scientific method. History has proven that method invalid repeatedly. So, instead, let’s have some evidence beyond “it’s getting warmer” and “we feel guilty for being polluters” (even if we all do) so it must be our fault. 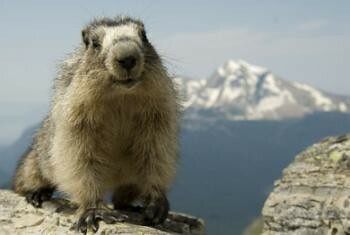 That Marmot looks liks he saying, “Cheeeeeese,” for the camera. I’m pretty sure that the glacier isn’t melting due to global warming. I’ts melting because it is in Montana. Montana hasn’t had ice age temperatures since waaaay before human caused global warming began.